The Christmas light prompt is: Some families string up a few lights each year while others go nuclear and are destined to force their neighbours into a brown out situation. 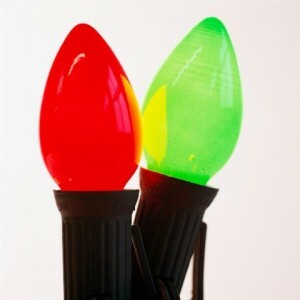 Did your family put up lights and outdoor decorations around Christmas time? What about the neighbours? And was it a favourite family activity to drive around to look at Christmas lights? What about any local attractions such as parks, zoos and the like which put up displays of lights and outdoor decorations? 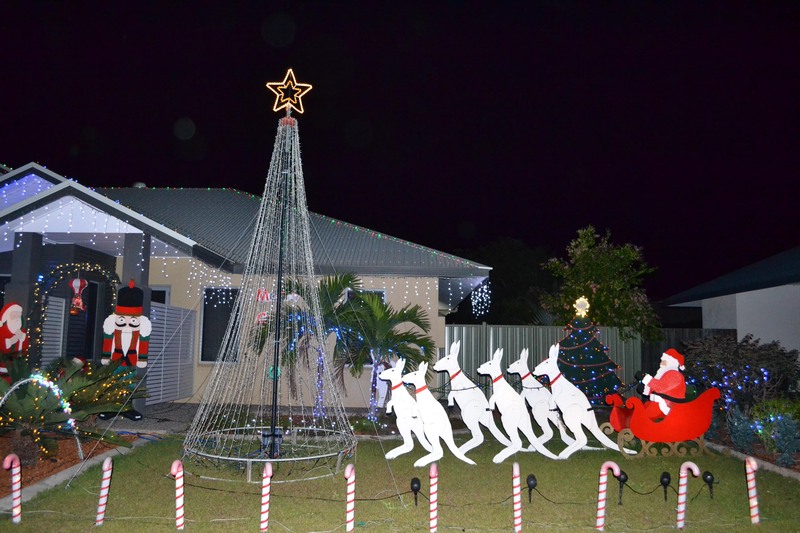 Christmas Lights in Darwin 2012: a very Aussie set of lights with Santa and his snow white boomers (kangaroos) in lieu of reindeer. As a child, lights were mainly restricted to shops and city streets. With long summer nights the further south you go, the less the impact of house or street lighting, unlike colder climates where the sparkle of lights everywhere brightens the darkness and the spirits. 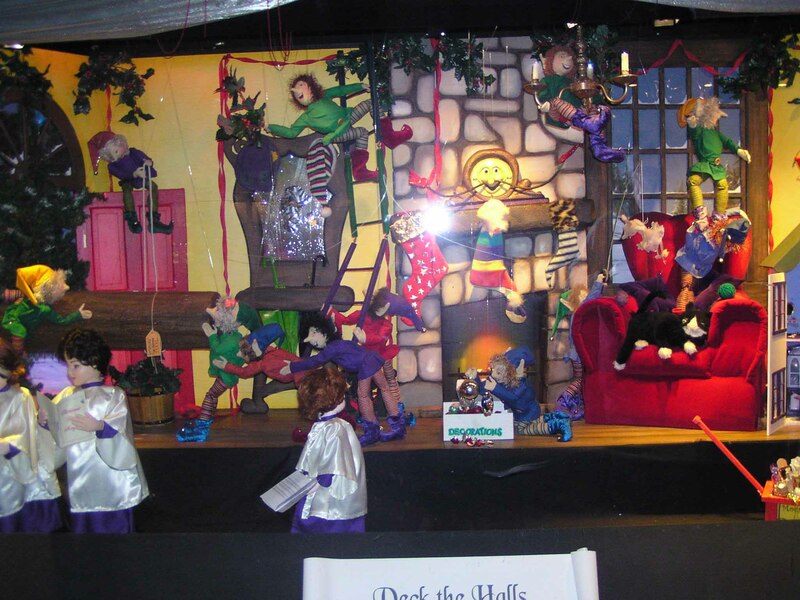 A Christmas window display in the David Jones’ window in Sydney 2006. 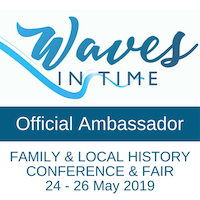 Instead it was traditional in those long-ago years to visit the city and see the wonderful Christmas displays (including pretty illumination and moving models) in the windows of our big department stores, like Myer or David Jones (or McWhirter or TC Beirnes). At different times we’ve seen similar window displays in Sydney as well and even in Dublin. 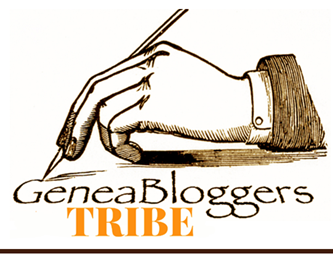 Still I think that amazement that one has as a child remains untouched. It’s still lovely to see them but it’s just not as awe-inspiring. I have no recollection of any houses displaying lights as happens today. It’s only in recent times (relatively) that the Christmas lights tours have taken off. We’ve only been checking out the Darwin lights for a few years and now regret we hadn’t realised the extent of the displays earlier. For our family, Christmas lights were probably as much about the Christmas Carols by Candlelight which we attended every year for decades, even when our littlest was only a few weeks old. It was so atmospheric to be in a park singing away to the performers on the stage and with candles swaying. Quite beautiful and helped to define Christmas and our own family’s tradition. Unfortunately, to our minds, the Carols by Candlelight became increasingly commercialised and tacky so we ended up no longer attending in person. However one tradition that remains is that we watch Carols by Candlelight from the Myer Music Bowl on Christmas Eve: it’s our only Christmas television tradition. Sometimes all the chores are done and we’re chilled out, some years it’s still a mad panic to get presents wrapped. Whatever the day brings, we find the enthusiasm of the crowd is infectious, and the camera crews always manage to find some super-cute babies to profile in their vision. I was quite astonished today to discover that the Carols by Candlelight tradition started in Australia –well at least according to Wikipedia. Perhaps that’s because our climate is more conducive to spending hours out doors at that time of the year. This post combines several topics for the Advent Calendar: Christmas lights, Christmas TV/Movies and a dab of Christmas Tradition. The 2011 topic was slightly different focusing on outdoor decorations: you can read my post here. Happy Christmas to all my readers wherever you are. 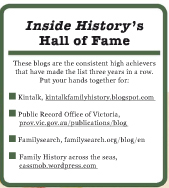 I wish you health and happiness today and lots of wonderful genealogy discoveries in 2012. 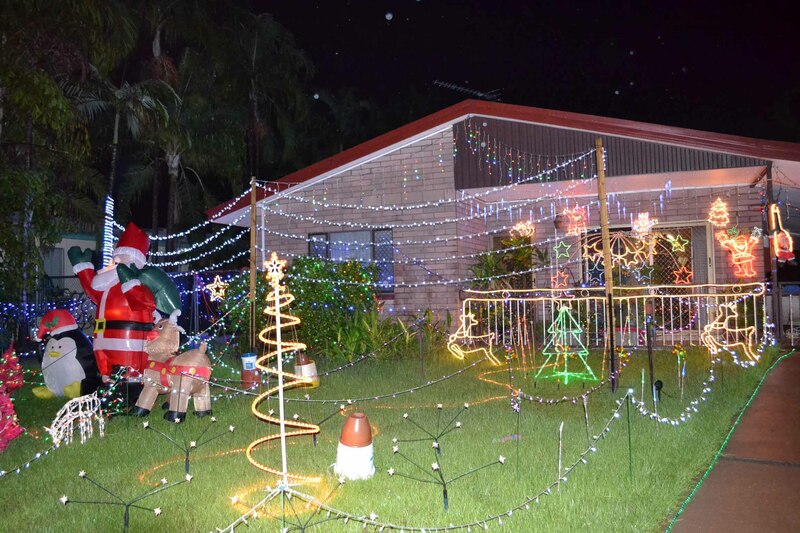 Today I’m sharing with you some photos from our drive around Darwin and Palmerston looking at the Christmas lights. 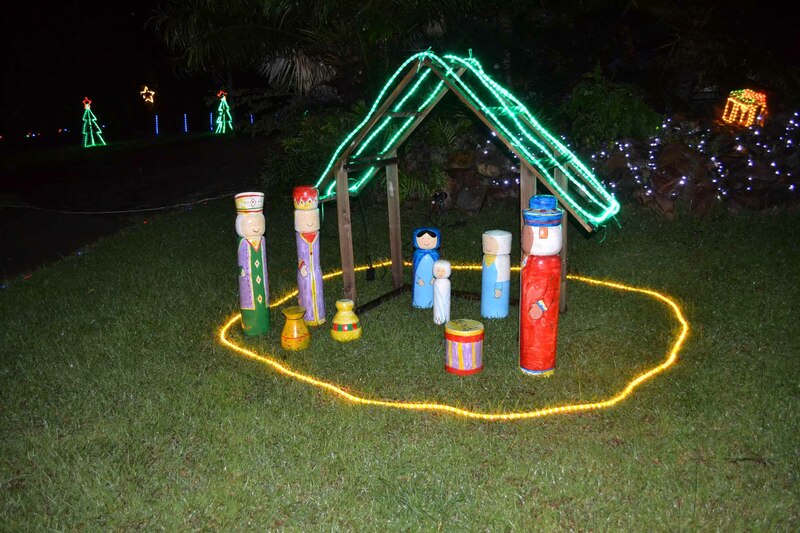 This display in Leanyer was the first we saw and was gorgeous….kids were enjoying being photographed near Santa. The owner was chatting to the visitors and was disappointed that his train display and accompanying sound were no longer working as they’d been destroyed by the bad weather. The visitors’ enjoyment was not deterred. 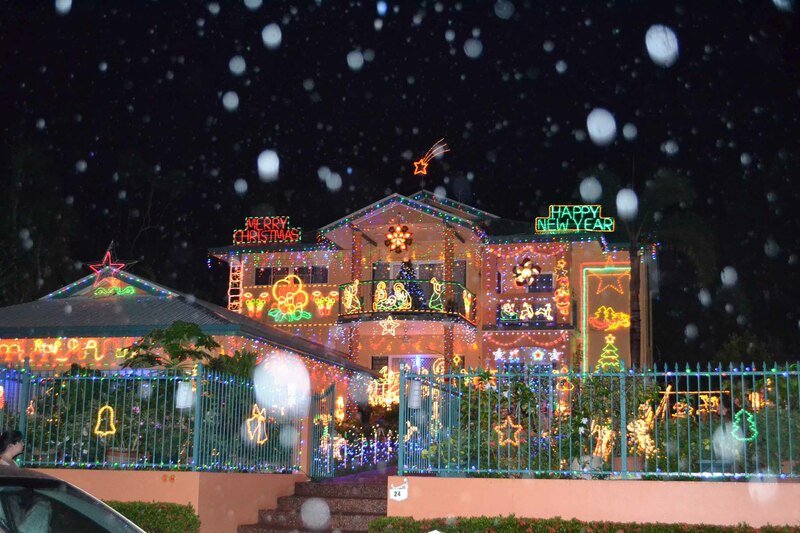 Hotham Street Leanyer is apparently Christmas Lights Central for Darwin. We’ve been here all these years and didn’t know that! Apparently this tree is the tallest Xmas tree in Darwin and required two visits from a cherry-picker crane to set it up and decorate it. Their efforts were well worth it for all the visitors’ pleasure. By the way, the dots in the sky are raindrops not snow falling – we have a cyclone around the ridges so there was a bit of rain about. Out in the satellite town of Palmerston this house is apparently another of the top houses for the lights and it was truly spectacular! 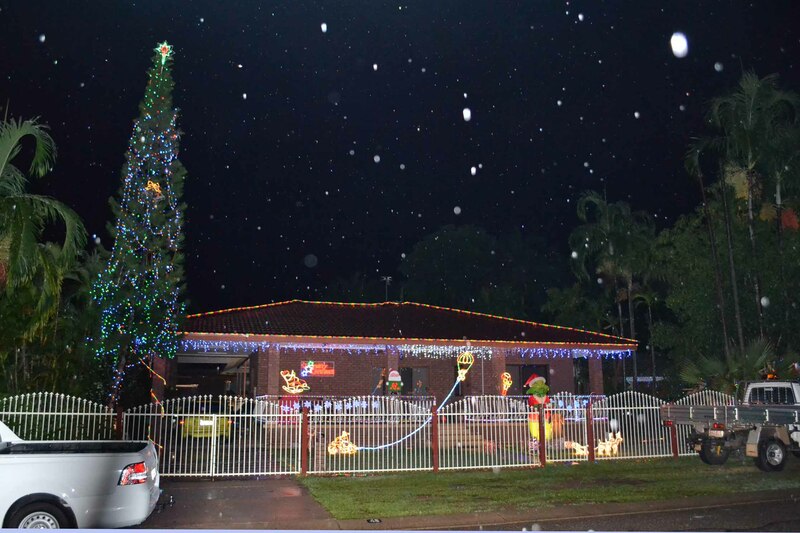 In a nearby suburb in Palmerston this display highlights the reason for the season. Happy Christmas!